Katie Heer, Project Manager of the Inland Empire Resource Conservation District, will present a water conservation education workshop. The program is sponsored by the San Bernardino Valley Municipal Water District and has been updated to reflect Governor Brown’s recent edicts on residential water use. The Chief reported that the Redlands Police Department recently earned Taser International’s RISE Agency of the Year award for its innovative approach to fighting crime which has resulted in implementing creative, technological solutions to significant law enforcement problems. In a year that saw both a dramatic reduction in the force’s budget and a dramatic uptick in crime (particularly vehicle break-ins), RPD undertook a new program whereby they planted laptops equipped with GPS tracking devices in unattended vehicles. Once successful arrests for vehicle break-ins became more common (thanks to the tracking devices), the program acted as a sufficient deterrent to reduce break-ins by nearly 20% over the course of three years. They have used this same approach for other type of theft cases as well including bicycles, wire/metal thefts and other crimes. Rick Harrell with the Eden Projects. Eden reduces extreme poverty and restores healthy forests through reforestation in Haiti, Madagascar, Ethiopia, and Nepal by employing local villagers to plant millions of trees — for only 10¢ a tree. So far over 95.6 million trees have been planted to provide a habitat for animals, purify water sources, control flooding and erosion and help to replenish the soil with nutrients needed for farming. To our wonderful, often funny and always competitive Student Representatives. All the best in the next chapter of your lives. We’ve thoroughly enjoyed your company. Thanks to Adam Gottlieb (U of R), Clare Lemos (RHS), Deanna Garcia (REV) and Thomas High (CVHS). Oh yeah . . . enjoy your summer as well. June 6th – our own Shirley Harry is competing in the Redlands Symphony Gala 2015 “Dancing With The Stars”. Vote Chicago style – early and often! June 19th & 20th – Library Days “Americana”, @ Smiley Library and nearby venues. June 27th – Redlands Sunrise Rotary Club will hold an oldfashioned Fishing Derby in the recently refurbished (by both our club and Redlands Sunrise Rotary) Ford Park ponds. A long-time friend and business partner has a photograph of his son taken when he was about 6 years old. In the photo, Nick is standing in front of an LA County fire truck, and he’s wearing a firefighter’s helmet and a broad grin. Today, some 25 years later, Nick is a firefighter/paramedic with the City of Monrovia. 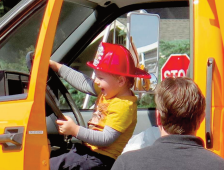 Those of us who were fortunate enough to attend all or part of the Touch-A-Truck event last Saturday at the U of R saw a great many kids and a great many broad grins. From the moment the event began at 9 AM, families with small children rolled into the venue at a fairly steady clip. Almost every child approached the big machines with excitement and awe, and reveled in the opportunity to sit in the seats, turn the wheel, and climb around on the big machines. It was amusing to several of us how much attention the school buses and the hearse garnered. It was not a shock that the fire trucks, police vehicles, and construction equipment saw a lot of traffic, too. Many of the moms and dads seemed to be just as excited as the kids to see the LLUMC Disaster Response Vehicle and the rest. Of course, the Beach Ball Dump Truck (kids throw beach balls into the dump truck, truck dumps the beach balls, repeat ad infinitum) was a huge hit, and when the RFD ladder truck extended the ladder full height and a firefighter climbed up, the crowd gasped it’s approval. We heard the words “awesome” and “best thing ever” a lot. Many people asked us “how long have you guys been doing this?” and “you’re going to do this again, aren’t you?” The consensus from the committee is that we would sure like to. My belief is that we must. It was too well-appreciated by our neighbors not to. Who knows? Maybe 25 or 30 years from now, some parent or grandparent will look fondly at a photograph of one of their small loved ones taken that day sitting behind the wheel of a vehicle that, as an adult, their “no-longer-little” kid pilots as a function of their career.